Many properties have lawn spaces and the grass lends a very green and fresh look to the area. It also becomes an excellent space for your kids and pets to play in or you can relax in that area as well. While all this sounds good, the lawns tend to get worn and old due to the constant use and foot traffic. Over time, the soil also gets compacted and that affects the growth of the turf. This is where lawn care services come into the picture. Damon Johnson provides excellent lawn aeration services to customers in and around Edmond and Oklahoma City. In addition to regular mowing and weeding, it’s also very important to aerate lawns. So what exactly is aeration and how does it help in the growth of the grass on your lawns? As mentioned, the soil gets compacted by all the use it endures. This affects its roots and less amount of water is able to penetrate the soil. This problem needs to be attended to on time; if you ignore it, that will only cause the grass to thin and your lawn will look bare in patches. Aside from this, soil compaction also affects water drainage. The one way to avoid all these problems is to get the lawns aerated with regularity. 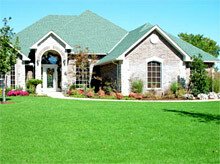 Most lawn maintenance plans include aeration as part of their standard services. It’s important that grass get the right type of nutrients and it’s why every lawn care plan includes fertilization. But it’s equally important for the roots to get enough oxygen on a regular basis and that’s what aeration helps in. Your lawn care contractor will use specific equipment to aerate grass in your landscaping, in the springtime. When the lawns are aerated well, that makes it easier for the fertilizers to effectively reach the root system; that means the grass’ foundation can breathe better as well. This is why aerating grassy areas is one of the best ways to ensure your lawn gets the kind of nutrition it needs. You will notice that a well-aerated lawn also stays looking good right round the year and it’s healthier too. Well aerated lawns add to the charm and beauty of your home and you will be more encouraged to use these spaces to relax and entertain in. In addition, properly manicured grassy areas help add to the value of your property as well. When you have lawns on your property you need to ensure that they are maintained well and get regular attention. The company you hire for the job should be able to provide custom lawn aeration solutions based on the size and spread of the lawns, and the types of grasses and soils that exist there. Hiring lawn care services experts like Damon Johnson ensures you get the kind of solutions you need at aeration cost that will fit perfectly into your budget.